Happy Thursday! Once again, I am linking up with Meghan from In THis Wonderful Life for mid week randoms. Yes, it's slightly after mid-week, I know. 1- Anjali loves music class (pictured below). Gymnastics--- not so much. She jumps for about 10 seconds then begs to be held. 2- Here is my sugar addict kindergarten kid enjoying an ice-cream on this lovely fall day. 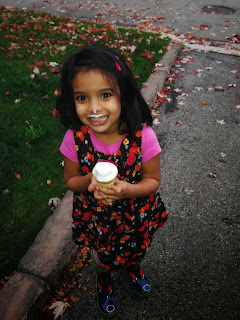 Never too cold for ice-cream, right Cass? 3- Kris and Bruce Jenner separated? Shocker. 4- The home re-org continues. This week's project- organising our home documents into this filing cabinet we purchased. I do this at night after both kids are asleep as it's quite the gong show when the baby tries to help me. That being said, the pot and pan cupboard is fine for her to help with. Check out the smile on her face when I emptied all the pots out. She thought it was Christmas. 5- This week, we are fasting for Navratri with no meat, eggs, alcohol etc. We do dairy though so it's not totally vegan. It's a bit of a fun challenge with our menu this week, as I try to think of interesting vegetarian dishes while still including protein sources. Maybe my favourite veg recipes will be a good idea for Favourites on Friday one day. 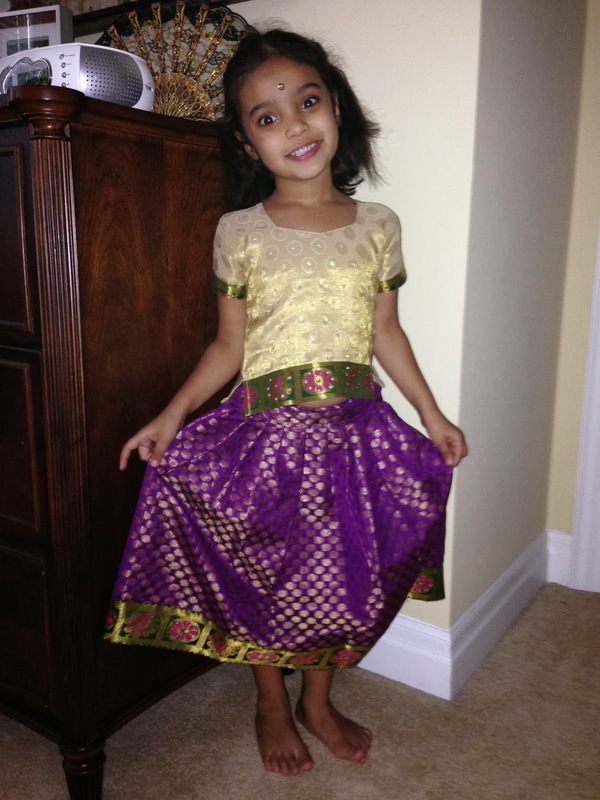 We went to a puja this weekend at our cousin Ammie's house this weekend and this little miss was SO excited to put on her East Indian clothes. 6- For the pumpkin fans out there, check out these recipes from Cup of Jo. WHo knew that pumpkin and chocolate chips make such a winning combo. Also, I am now slightly obsessed with the Starbucks Pumpkin Spice Latte. Alas, I haven't been having it because of the calories. Maybe this weekend I will splurge. I literally think of it everyday though! 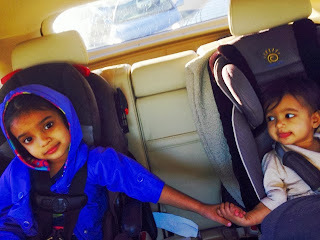 7- These little ladies are always holding hands in the car. It is the cutest thing. 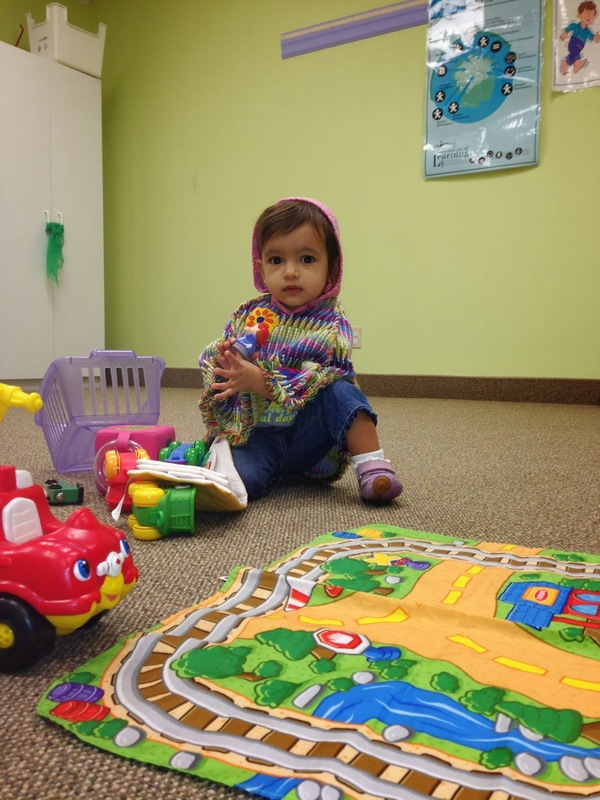 Anjali is in a much better mood in her carseat when Cass is around. 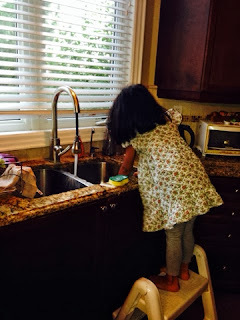 8- Look who washed up the dishes this morning. Just because "I want to help you Mommy." I did not discourage it. Bring the child labour on! Long weekend coming up! So excited!